Click arrow to listen to the 90-second podcast. Helping your child to recognize and manage their feelings and emotions, is a necessary life skill, which will help them succeed and lead a productive life. Often, children cannot communicate what they are feeling, which may cause inappropriate behavior or heightened stress in certain situations. As adults, we understand these feelings, and can show our children how to recognize feelings as they happen, how to express them appropriately, and how to identify emotions in others. We can also help them be aware of how their emotions affect others, and to become more sensitive to what others need or want. One way to help your child learn to name what they feel is to create a feelings chart that lists the different emotions that people can have. Depending on the age of your child, you may want to use pictures to describe the feelings. For older children, another way you can help them is to create a journal for them, where they can capture feelings, thoughts and moods. These things give children an outlet or a way to express feelings, and can minimize unnecessary stress. They also give adults a chance to show children that they understand, tell them that what they are feeling is okay, and to model how they should properly be expressed. Helping your child learn to recognize and manage their feelings will help them to navigate through life successfully and become a caring, responsible adult. Raising Kids Who Can Cope is a 28-part series developed to build skills, knowledge and awareness in adults who play a role in young people’s lives. It is brought to you by Jackson County UW-Extension and Together for Jackson County Kids. Find out more at Raising Kids Who Can Cope. 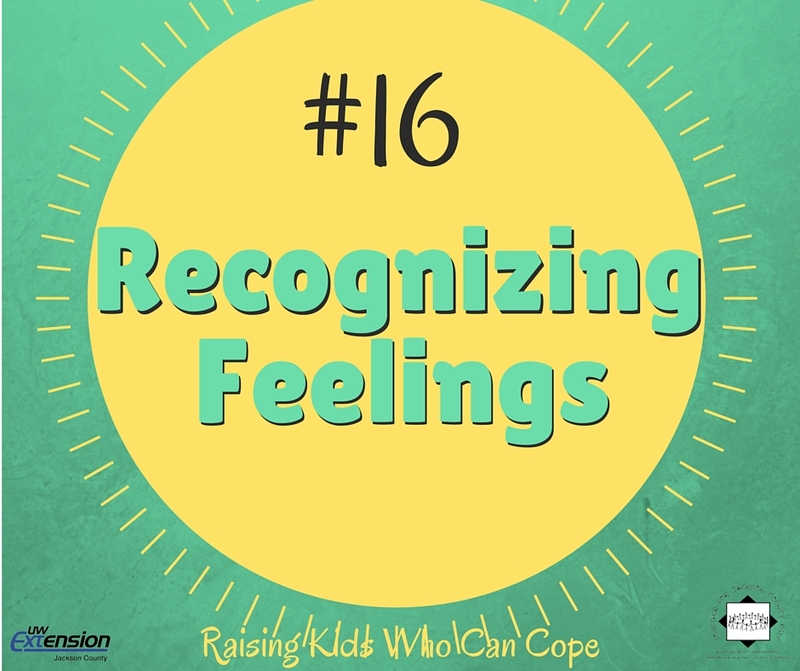 This entry was posted in Raising Kids Who Can Cope and tagged coping skills, emotions, youth. Bookmark the permalink.